Since there has been civilizations, we have been envisioning creating the perfect society. One that functions for everyone, is environmentally sustainable, and free from the threats of crime and violence. This desire to construct a utopian existence is one of the reasons games like SIM City or Suburbia have enjoyed such great success, despite being about the relatively bland subject of urban planning. Heck, it’s one of the reasons that stories about the collapse of society are so popular. They give us a chance to envision starting from scratch and deciding how we would do things differently. In Neom, you get the chance to ’Create the City of Tomorrow’. You start with your barren City Board, a 5×5 grid of planning space with only a City Center marked in the direct middle. Over the course of three Generations, you’ll draft new tiles into your city to create residential neighbourhoods, establish industries and commercial hubs, build public offices, and harvest resources. Before my first game of Neom, it was pitched to me as a close cousin of 7 Wonders and Carcassonne. I have to say that evaluation is pretty apt. I’ll also say that my friend who recommended it was right that I would really enjoy it, based on my love of those other two titles. Neom marries drafting with tile laying. All of the City boards have a different landscape and appearance, and each one produces a unique Raw Good giving everyone an asymmetrical starting position. 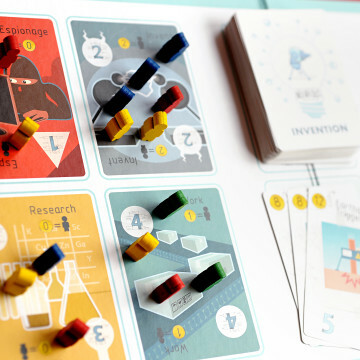 Before the game starts in earnest, there is an initial drafting round, where you will select three Cornerstone tiles. These can be worth huge end game points and inform you how to draft during the game. Each Generation begins with eight City tiles dealt out, and you’ll simultaneously draft one to add to your growing city and then pass the rest on. Generations last seven turns, with the final tile being discarded. 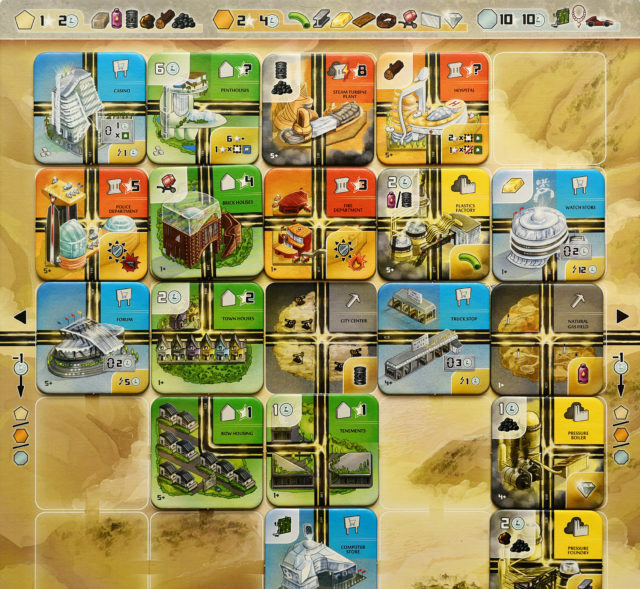 After a tile is selected, you get to take an action, either placing the tile in your city, meeting its requirements in either Coins, resource production, or other buildings. Instead of building the selected tile, you can build the Cornerstone tile you got at the beginning of the game, or simply discard the tile for five coins. When you place a new tile in your city, it can go in an empty space, or cover an existing tile, however it must be connected to the City Center via roads. 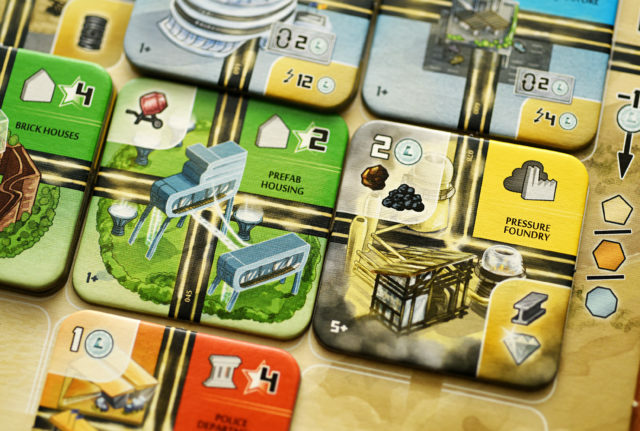 City tiles are divided into different types, each with their own unique powers and values. Residential tiles usually have a point values and little else. The goal with them in to group them together into Neighbourhoods. The bigger the grouping, the more points they’ll be worth at the end of the game. If you have too few Residential tiles, or you build them close to polluting factories, you’ll lose points. Commercial tiles don’t have a point value to them, but they will generate much needed income each round. Industrial tiles also don’t provide points, but they will produce Processed and Luxury goods that will be useful in constructing certain buildings. However, Industrial tiles produce pollution, so be careful where you place them in the city. Public tiles will earn you points at the end of the game. Some have a straight up value to them, and some of the values will be variable depending on the makeup of your city. Finally, Resource tiles will provide you with Raw goods which you’ll need to continue your development. In each Generation deck, there is one unique Disaster tile which works a bit differently. 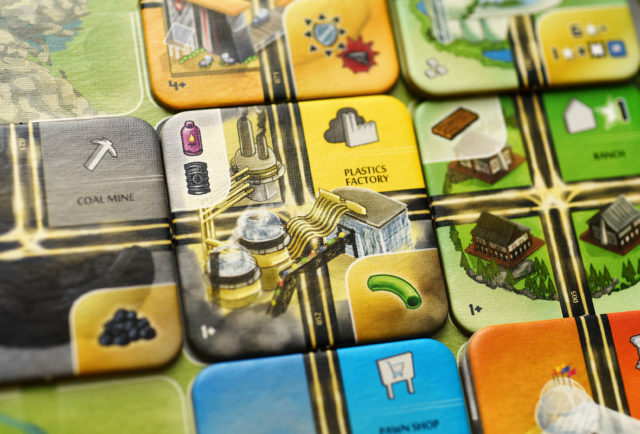 Disaster tiles don’t go into your city, but when you play them it activates a negative effect for all other players. The Flood, Fire, and Crime Spree tiles will make players pay money or discard tiles that are not protected. There is no way to mitigate the Flood, but the Fire Department or Police Department tiles will protect parts of your city against the Fire and Crime Spree Disasters. 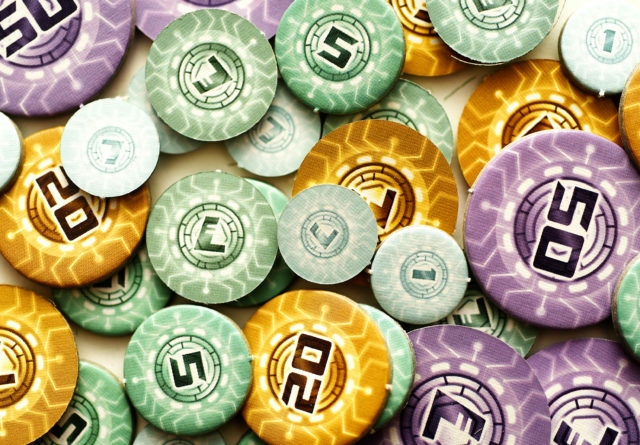 You may not always have the necessary resources you need to place the tile you want in your city, but there are ways to purchase them from your neighbours (like 7 Wonders). The price of Goods is determined by the type (Raw, Processed, or Luxury), the distance away from you you’re buying (so, your direct neighbours add no cost to the resource, but someone two seats away from you adds a coin to the cost. 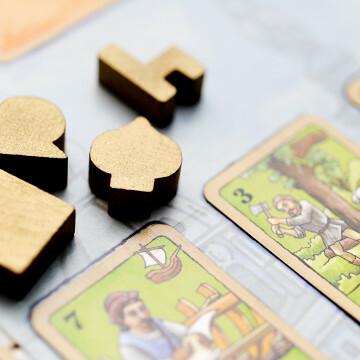 Three spaces adds two coins and so on), and whether or not you have a Trade Route in the direction you’re buying from. 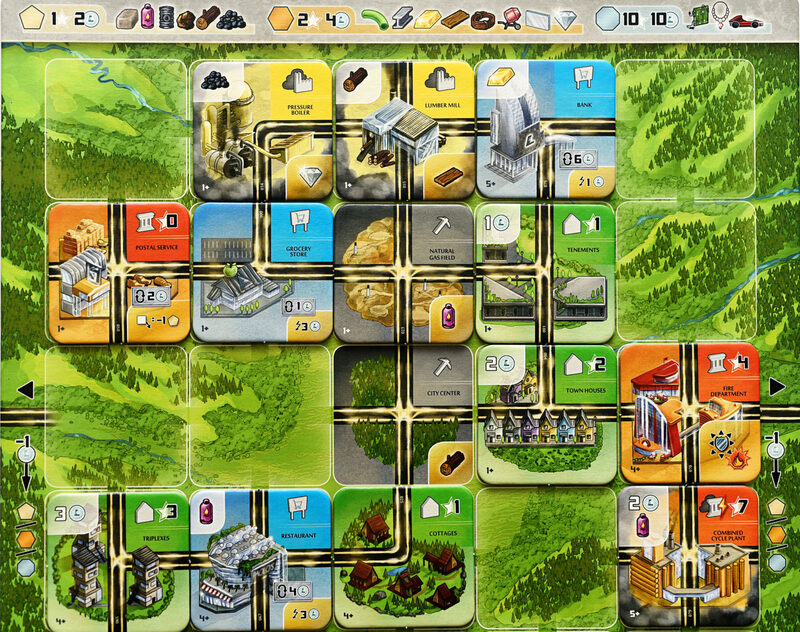 Trade Routes are an established road from your City Center to the side of the board you’ll be buying from. If you want to buy a Raw Good from a neighbour two seats away from you, the cost is $2 for the Good and $1 for the distance. It can be reduced by $1 if you have a Trade Route in that direction. Just like in 7 Wonders, once you produce a Good, you have access to it for the rest of the game. Neom ends after the income phase of the third Generation. You’ll score points for any tiles that provide them, the size of your Neighbourhoods, the Goods you produce, every $2, and you’ll lose points for having pollution near your Residential tiles or having too few Residential tiles. You’ll also lose five points if you don’t have at least one tile with a Power Generating symbol. Your people need lights! I find Neom very satisfying. As I mentioned, it is a great combination of some mechanics I really enjoy, the rules are simple to learn, and once you have the iconography down, games fly by really quickly. I think drafting is a perfect way to randomize each play. You never know how the different hands will be made up, and each time you look at a new set of tiles, it’s a challenge to determine what might be the most advantageous. There is not a ton of direct interaction between players, but that suits a lot of people just fine. They’re happy to construct their own little world and not worry too much what anyone else is doing. Aside from drafting the tile you need or playing a Disaster, you can pretty much focus on what you’re doing and ignore the competition. I am a big fan of Neom, and I look forward to becoming familiar enough with the tiles and combinations that I can play at a 7 Wonders-like level of expertise. 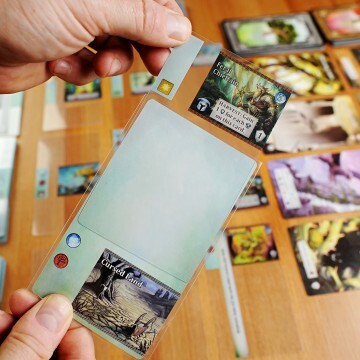 Neom is a competitive drafting and tile laying game for 1-5 players. It is designed by Paul Sottosanti and features art by Christian Opperer. Neom is published by Lookout Games and Asmodee. A review copy was generously provided for this article.